Peaceworks: INF Treaty Withdrawal Increases Nuclear Danger. INF Treaty Withdrawal Increases Nuclear Danger. 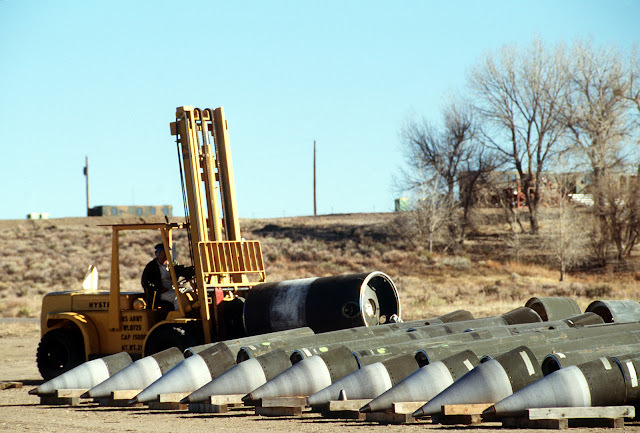 Under the INF Treaty the U.S. destroyed 846 missiles, while the Soviets destroyed 1,846. On February 1, the Trump administration took another step in the direction of making the world a more dangerous place. 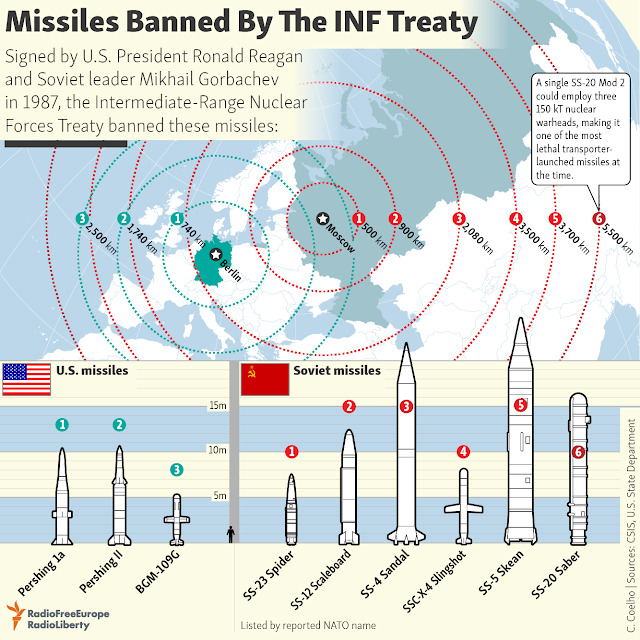 By withdrawing from the Intermediate Nuclear Forces (INF) Treaty, agreed to by Presidents Reagan and Gorbachev in 1987, Trump is setting the stage for a new, dangerous and expensive, nuclear arms race. The INF Treaty was a major step forward in ratcheting down Cold War tensions. It is the only arms control agreement that eliminated an entire class of weapons, land-based missiles with a range of 500-5,500 km (310-3,420 miles). This led to the elimination and destruction of 2,692 missiles. This class of weapons is especially dangerous and they have the ability to reach their targets in just a handful of minutes, and thus are seen as first-strike capable. This also means that an adversary might put their missiles in a hair-trigger, launch-on-warning mode, and this increases the likelihood of accidental or mistaken launches with disastrous consequences. The situation is further complicated by the fact that the INF Treaty was negotiated in the context of the U.S. and the U.S.S.R. both abiding to the terms of the 1972 Anti-Ballistic Missile Treaty. Unfortunately, in 2002 George W. Bush withdrew the U.S. from this treaty, and the U.S. began installing “missile defense” systems in some of the new NATO countries of Eastern Europe. While “missile defense” sounds both harmless and difficult to accomplish, in fact it would be most effective not for true defense, but as part of an offensive first strike strategy. If a surprise attack on an adversary knocks out a significant fraction of their nuclear arsenal, a defense system, that would likely be overwhelmed by a full-blown attack, might be effective in handling an attenuated and expected retaliatory strike. The U.S. has maintained for several years that Russia’s new missiles violate the treaty. Russia disputes this and claims that the U.S. is out of compliance. In our opinion the dispute should be resolved through negotiations. The INF Treaty should not be scrapped. But this is part of a dangerous pattern. Since entering office, the Trump administration has not only withdrawn from this important arms control agreement. They also have pulled out of the Iran nuclear deal, heightening tensions in the Middle East, despite the fact that the U.S. intelligence community has verified that Iran is in compliance. And on another important track, they are in the process of pulling the U.S. out of the Paris Climate Accord. It seems that Trump thrives on creating international tension. This dovetails nicely with increasing military budgets, which Trump has pushed since Day One. More weapons procurement leads to fatter profits for military contractors, who, in turn, lend support for his political agenda. Russia has now announced that it, too, is withdrawing from the INF Treaty. This is really a no-brainer, as when the U.S. leaves there is no longer an agreement. That said, it is unclear what, short of getting the U.S. to give up “missile defense,” or the dissolution of NATO, would the Russians like to see. It is clear that they feel threatened by the eastward expansion of NATO right up to their western border. And they certainly wouldn’t want the U.S. to base offensive intermediate range missiles in Eastern Europe. It is also questionable that any NATO country would agree to hosting such missiles, making themselves a prime target in the process. It seems that it would be in both countries’ security interests to continue the treaty, but this does not seem to fit Trump’s game-plan. What he really wants is unclear, and relations between the U.S. and Russia are all suspect at this point simply because Trump, accused of collusion with Russia regarding the 2016 election campaign, is seen by many as perhaps posturing with regard to any conflicts—real or not—with the country that is defined by the mass media and many in the political establishment as a primary adversary of the United States. Further complicating the equation is the rise of China. When the INF Treaty was put in place, it was only between the two nuclear superpowers. Trump has, in recent months, asserted that China should also be included in any future permutation of an INF Treaty. While Peaceworks supports multilateral arms control and disarmament efforts, dismantling the current bi-lateral agreements does not seem to point us in the direction of eliminating very real threats. In fact, it seems to extend an invitation to emerging and potential nuclear weapons states to aggressively pursue their nuclear ambitions, as that’s exactly what the states with the vast majority of all such weapons are, sadly enough, doing. U.S.Pershing II Missiles being Dismantled Under the Terms of the Treaty.